(Trayodasi up to 2.32 AM next day (Chathurdasi afterwards ) and Jyeshta up to 1.15 PM that day and then Moola Nakshatra afterwards) . Sridharan SAnkaran is the opinion that it should have been typed as THithi and not Thidhi as I have done It is up to you to take it the way you want .I have deleted his comments.DEar Sir, please do not post any more comments on this. how can we take it whatever way we want ? Only one of the 2 has to be correct. If we write it as Thidhi , it will be थिधि or तिदि etc in devanagari. Try to search for the word तिदि and Google will auto correct it to तिथि and show you lots of relevant results. Try to search for तिति and you won't get any results. So the point is it is not तिति or तिदि , but तिथि. Finally, I called an eminent prof of Sanskrit and retd HOD of Sanskrit dept and President award winner for his opinion. He too said तिथि is correct. And तिथि can not be written as thidhi in English by any stretch of imagination. Tithi is correct phonetically. Please do not delete any posts. We are having an intellectual discussion. We are not using any abusive words or personal attacks. Let other bloggers and users with Sanskrit knowledge also give their opinion . Deleting reader comments is like curbing freedom of expression and it is undemocratic. I agree with you .RGe discussion is about transliteration and not about SAnskrit spelling .Should be written as thithi or should be written as Thidhi. I always type Thidhi THe people who ise my manthras know it .THese type of discussion would only confuse them. Deleting comments which I do not agree is my right .I am very ordinary person and I should safe guard my interests I would not be participating in this discussion any more .I know तिथि is correct. If a same set of limited people see your page, then we can say, they know how to read thidhi. But this site is on internet. Any body who googles and gets this page can see it. And they will be confused or misguided to see this "thidhi" spelling. If they are knowledgeable, they will think you are not knowledgeable. If they are not knowledgeable, then they will pronounce it as तिदि and thereby attract mantra dosham. More than deva kaaryam, pitru kaaryam has to be done with more shraddha and correctness. If you think those who are used to your spelling will get confused if you change, I want to make a mention about Sri V.Govindan and his huge work in translating and transliterating ALL Thyagaraja kritis into various Indian languages and English. At the beginning of each kriti , he has mentioned his standard transliteration scheme and how to pronounce like this . Any such scheme will bring uniformity so that those who are already familiar with your site and new users uniformly understand the transliteration scheme and read/ pronounce the same way. You are doing a service and all these suggestions are with the good intention that it should be flawless and full fruit is got by all. It is not for finger pointing. so far I was thinking that thidhi has to be read as तिदि . Now I understand it has to be read as तिथि. Thanks for pointing it out. I dont know how many more are wrongly reading like what I was reading. The main difference between sanskrit and a language like tamil or english is the pronunciation. So we have to do whatever it is possible to highlight the differences. thidhi vs tithi makes lot of difference. Ramachander sir, pls dont take it as who is right and who is wrong. It is not V.Govindan vs Ramachander comparison. That is not the issue. Also doing something for past 20 years does not mean same should be done the same way for the next 20 years. Do not take feedback personally in a negative way. You are doing a great service, we are not finding fault. We are only giving suggestions for improvements. As you will agree, there can always be improvements in whatever we all do. That is the spirit behind this. Similarly, it is not difficult to change mase to maase , nama to naama etc. Simple differentiation between Long vowels vs short vowels . Again some nice to have suggestions, not fault finding. I don't understand why a simple suggestion to improve readability should be face so much questioning and cajoling. For Greeshma , there is "ee" in this blog, which is good. Not single "e". Because it is long vowel. Similarly, "mase" can be written as "maase". Valid suggestion. And what is the point in saying I know it is तिथि but still I will write "thidhi" ? We are not in any fault finding mission. We are only suggesting for betterment of this site. Telling I am doing this for 20 years the same thing does not help in improving. 20 years back we did not use mobile phones and emails, now we are using for betterment of our life. Don't we ? So , for betterment of this site, such small suggestions can be incorporated without taking this personal. Thanks for all your suggestions I There are no hard and fast rules for transliteration. I would prefer my method which is liked by my readers. If any one feels that it could be bettered , they can get it done and post it in their blog.I would be grateful to one and all if they do not continue this type of writing which hurts me.May God bless you all. "There are no hard and fast rules for transliteration"
"I would prefer my method which is liked by my readers"
Many of your readers have pointed out - Sridharan, Abinaya, Vichu, Myself, Hariharan that the correction is required. Since your readers want, you can change. "I would be grateful to one and all if they do not continue this type of writing which hurts me." Ok Sir fine, that is the way you take suggestion. भद्राः क्रतवः नः विश्वतः आयन्तु Let noble thoughts come from all directions , says Rig Veda. May God bless you too SIR. Especially protect you from mantra dosham. I am very sad to go through these blogs. Many are not ready to take pains and publish such useful mantras. But when someone does, I find people ready to point out errors. Such gestures will kill enthusiasm of existing good souls like Shri.P.R.Ramchander and may prevent new ones to venture out. Please leave such people alone. My humble submission. It is unfortunate that giving suggestions or fixing errors is seen as a negative thing. To err is human. Everyone knowingly or unknowingly can make some errors , big or small. No one is perfect. There is always scope for improving anything. What is important is to see that in the right spirit and say 'thanks for the suggestion, it is easy to implement, here we go', instead taking it as an ego issue of 'I am so and so, how can you point out any mistake'. Thank you sir for the consistent efforts put up by you to help us perform tarpanams with the details provided. I do believe the blog is intended for ordinary non-Sanskrit knowing people like me to use as a ready reference as those well versed don't have to rely on your blogs. My humble submission, ignore the nit pickers and please keep up the good work. it is the other way. Those who know sanskrit can auto correct and read correctly Sanskrit words written wrongly. Because they know Sanskrit, they know its pronunciation, meaning etc. Since you say you are "ordinary" person without Sanskrit knowledge, people like you need more hand holding and guidance than those who know Sanskrit. That is the reason "thidhou" vs "thithou" becomes important. It is not nitpicking. Mantra dosham that one can attract due to wrong pronunciation or splitting of words can give negative effects. Prof N.Veezhinathan , a sanskrit scholar , ex HOD of Sanskrit in Madras Univ and advisor the legend MS. Subbulakshmi once told me "never sing mantras such as Lalitha Sahasranamam in ragas. Because, when we sing mantras in ragas, we may make compromise in word splitting, pronunciation etc. And that will lead to disastrous effects". The same rule is applicable for pitru tharpanam mantras also. Reciting it wrongly is a sin . This reminds me of an incident. A few years ago, I stumbled upon a website whether Lord Shiva's name was mentioned as "artha nareeswarar". The website was good, but for this mistake in spelling of the Lord. I wrote to the owner of the website saying it should be "ardha nareeswarar" and NOT "artha nareeswarar". "Ardham" is half. "Artham" is wealth/money. "Naree" means lady / woman. The meaning changes completely with spelling. "Half lady" becomes "wealthy lady". When I explained this, his immdt reply was "Thanks for pointing it out, no one pointed this mistake before. I will correct it.". That was gracious on his part. Thank you for the good work you have been doing. It is really helpful.Please continue the good work. No one is asking Sri PRR to stop his work. No one is criticising his service or trying to prove who is right. So please do not mis-interpret. All we say is to better the current work ; make it more effective. Human endeavour has always been to become better and better in what we do and not to stagnate. தர்ப்பணத்தின்போது வாத்யார் சொல்லும் மந்திரங்களை நாம் சரிவர உச்சரித்து எள்ளு ஜலம் விட்டாலே போதும். பித்ருக்கள் திருப்தி அடைவார்கள். பலன் கிடைப்பதும் நிச்சயம். For those who can not read tamil script, the gist is for tharpanam to be effective, one has to pronounce the tharpanam mantras properly. He has lamented that people don't give enough importance to that. So it is also the responsibility of those who are guiding people who do tharpanam to pronounce the mantras properly. For pithru kaaryams, "shubhayoga, shubhaKarana " should not be told. Instead "vishnu yoga, vishnu Karana " should be told. Sri Ramachander's document "Introduction to Tharpanam " also has "vishnu yoga, vishnu Karana " only. Iyers always tell "Shubha yoga, Shubha karana" THere is nothing Ashubha in Pithru Karyams .Ofcourse all Vaishnavites chant as you have suggested. I have several tharpans books and in all of them it is Shubha yoga.. I am 77 and moving fast towards 78.My pranams to the scholars and professors.I would be discontinuing this service from next year and so bear with me for one more year. Pranamams. In our village, Vadhyar (Palakkad Rajesh Sasthrigal) says that the Aadi masa krishna paksha Navami comes on 1st of Aadi, In all Panchagams otehr than Srirangam Panchagam says that the Aadi masa krishna paksha Navami comes on 1st of Aadi masa. But in Srirangam Pachangam the Navami of the Aadi masam comes on 31st of Aadi masa. Vadhyar says that the Sriranga Panchagam is wrong to calculate the Aadi masa krishna paksha Navami. Similarly the In Srirangam Panchagam the Aavani Avittam falls on August 7th. On that day the Chandra grahanam will occurs. Our Vadhyar says that there is rules that Sradha Karmas will not do on the days of Grahana Occurs. So on that day Avani avittam will not comes. Our vadhyar says that Kanji Periyavar also agrees this argument. Vadhyar says that, in this situation Kanji Periyavar declared that the Aavani avittam will celebrate on September 6th. I request you please clarify this after the discussions with Vedic Pandits and scholars and publish in this group. Kindly follow the Panchangam your Vadhyar follows. August 7th is definitely not Avani avittam , as it is Chandra Grahanam that day.To my best of knowledge We have to get declaration from Sringeri mUtt, which has not told any thing about it. I have been a regular reader of your blog and feel immensely blessed.It is people like you who have and will help "brahmaneeyam" to sustain against odds. People like Sridharan Sankaran, Vichu Vishy and Abinaya Ranjeet are just noisy distractions - just keep doing your good deed. Please delete the comments of such people to keep the focus of readers to what is relevant. Performing Aadi amavasya tharpanam eradicates the effects of sorcery and black magic. It will grants peace and prosperity of your life. If you want to bring success in both professional and personal life, perform Amavasai Tharpanam get a blessings from your ancestors. We know there are 4 vedas. Next, we have 6 vEdAnga (the limbs of the Vedas) - the Siksha and Vyakarana of Panini; the Chhandas of Pingalacharya; the Nirukta of Yaskacharya; the Jyotisha of Garga; and, the various Kalpas authored by various Rishis. For Kalpa, each of the four divisions of the Vedas has its own special Kalpas. There are several traditions of Kalpa Sutras; and are attributed to various Rishis. Among the Kalpa Sutras, the Asvalayana, Sankhyana and the Sambhavya belong to the Rig-Veda. The Mashaka, Latyayana, Drahyayana, Gobhila and Khadirai belong to the Sama-Veda. The Katyayana and Paraskarai belong to the Sukla Yajur-Veda. The Apastamba, Hiranyakesi, Bodhayana, Bharadvaja, Manava, Vaikhanasa and the Kathaka belong to the Krishna Yajur-Veda. The Vaitana and the Kaushika belong to the Atharva-Veda. Now to which kalpa Sutra you belong to is decided by your veda. For example, if you belong to sama veda, you will come under ANY ONE OF Mashaka, Latyayana, Drahyayana, Gobhila and Khadirai . You can approach the elders in your family/ extended family to know this. The pravaram (list of rishis) is decided by your Gotra. Lastly, if you want to do tharpanam properly, pronunciation of mantras is very important. Pls ensure you learn that properly through elders / acharya . There are also many good tharpanam videos in youtube with proper pronunciation. Reading mantras from English without any special transliteration scheme (like what is there in this site ) will murder the mantras and will only attract paapam. There is a full day FREE Amavasya tharpanam camp to be conducted in Chennai on 15/Aug/2017 by Sarma Sastrigal which will cover the importance, right way of doing, mantras and their pronunciation etc. If you are in Chennai, you can enroll and get benefited. You may contact 9444214443 / 8754496329 to enroll. Please enquire from any elder in your paternal family .THey will tell you. 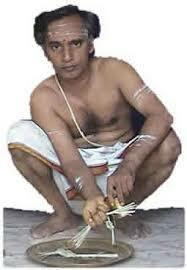 I do mahalaya tharpanam daily from 6th Sept. Accordingly 17th is dwadashi, 18th is thriyodashi, 19th is chaturdasi, 20th is ammavasai and 21st is pradamai. 19th is treated as mahalaya ammavasai, while ammavasai is only from the afternoon. so should we skip one thithi ? Thanks for your guidance Sir! PRR pranams and I am blessed! Pl.continue your service. In case of monthly sankramanam(if sun changes his rasi at 12pm for example),as i am a office goer can i go tharpanam after 8:24 am(Sangava Kaalam) and go to office. Could you post me ammavasya tarpana mantras for Telugu Krishna Yajurveda Apastambha Sutra people since the methods differ from Tamil procedure. efforts to bring these sankalpams to wider audience who stay in far off places(Indore) and are not blessed with vaidikas rely on your blog since my father death when i started tharpanas in 2015. since then it has been guide to me in performing my tharpanams. Thank you sir for your yoemen services to the community and people like me who do not have elders and are single at home and yet want to dutifully execute their responsibilities. Thank you and pranams to ramachander AVL. Every eve before amavasya, i visit this blog to pick sankalpams. I do not know how to thank you! Thank you and pranams to Baahmashri ramachader avl. let lord shiva give you long life and health. 1. Kadaka Ravi Sankramanam (Dakshinayana punya Kalam). 4. Uthrayana Punya kalam/Makara Ravi sankaramanam. Request to send me with dates etc. I personally thank you for the good work you have been doing. It is really helpful and appreciate a lot.lot. Fee blessed. V look forward to sankalpams(vaishnavites) for the thirties in 2018-19. Thanks.